I was playing fetch with my dog the other day. 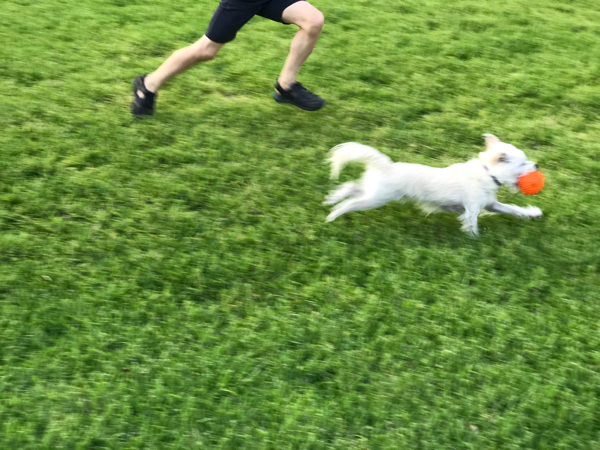 He loves to chase after the ball. But then he doesn’t want to let it go when he brings it back to me. I know that in order to throw the ball, I need to take it first. But my dog doesn’t always get it. It made me think of similarities to some SEO optimizing situations I’ve been in. Marketers want more website traffic through SEO but aren’t always willing to take the time to develop an SEO strategy with keywords. Just like you need to take the ball to throw it, in SEO, you need to develop keywords in order to gain the right website traffic. “But wait!” you might say, “You just talked about how keywords don’t matter anymore in your topic clusters blog.” Not quite. What that blog shows is that keywords need to be a part of a greater strategic framework around topics. But keywords still matter…a lot. The average Google search is still being done with keywords. Most searchers are not typing sentences or paragraphs; they’ve been trained to search with a few high-level terms. Of course, the advent of voice searches using tools like Google Home makes it easier to ask questions of Google, so the trend is moving away from simple terms. Keywords help tell Google what is important to you. While the one-to-one relationship between keywords in searches and keywords on your page is largely gone, including keywords in meta data can still be valuable to help Google understand what you consider to be important. However, the old strategy of keyword-stashing is now actually detrimental to your Google search ranking. Overuse alerts Google that you are trying to trick their system. Keyword ranking is one metric to show the health of your website. Knowing what direction your keywords rankings are going can still help you determine if your SEO strategy is working. It can’t be a static measurement; keyword research needs to be ongoing. I know something about playing fetch with my dog and I know something about creating successful SEO strategies too. If you would like a free consultation to evaluate your website, give me a call.